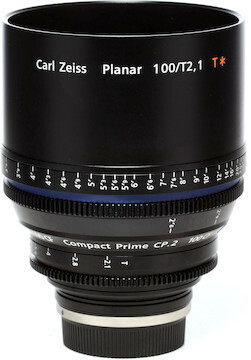 The Zeiss Compact Prime CP.2 100mm/T2.1 CF Cine Lens (PL Mount) is part of the second generation of CP cinema lenses that were the first to offer full-frame 35mm coverage of large sensor DSLRs (such as the Canon 5D Mark II). What distinguishes the CP.2 from its PL-mount-only predecessor is its interchangeable lens mount, which allows the included cinema-standard PL mount to be easily swapped out for an optional Canon EF or Nikon F mount. For the first time, a single, affordable, professional quality lens can be used on both cinema and still cameras, opening up creative possibilities that keep your rig lightweight, versatile, and on budget. Based on the Planar design, this fast telephoto extends the reach of your camera while also allowing for close focus up to 2.5 ft (0.7m).